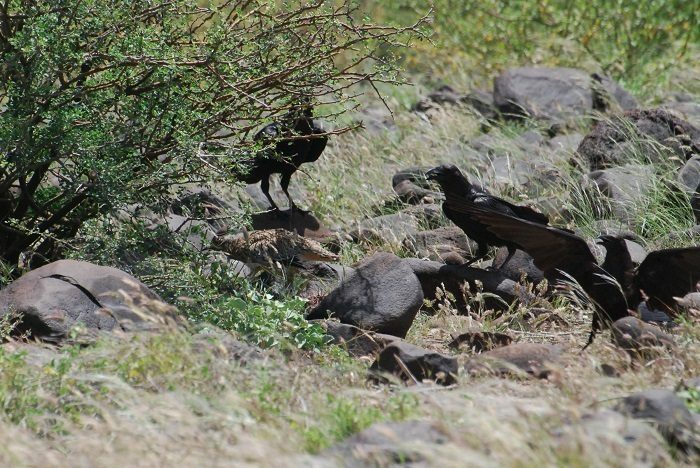 The dwarf raven or Somali crow (Corvus edithae) is an endemic resident in Eritrea, Ethiopia, Somali, Kenya and SE Sudan (Fry et al. 2000). In Kenya they are locally found mostly in the North from around Kapedo, Laisamis, Mado Gashi and Wajir areas. These birds belong to the family Corvidae. They are medium to large passerine birds. They are conspicuous, bold, inquisitive and highly adaptable. As a family they occupy a wide range of habitats including forest, woodland, grassland, tundra, desert and cliffs but more often around human habitation (Fry et al. 2000). 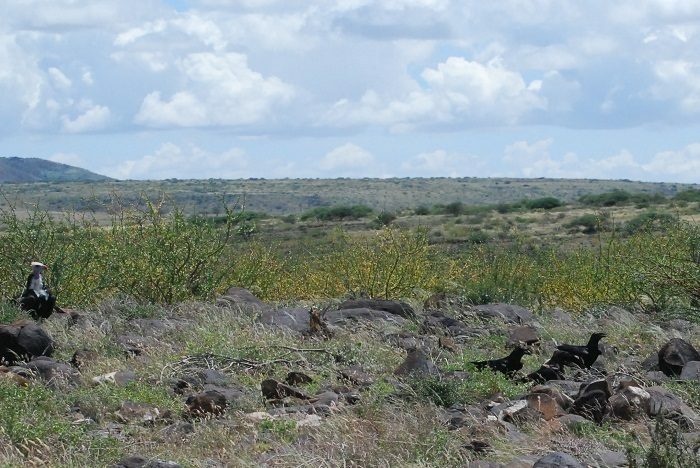 This species, in particular, inhabits deserts, semi-deserts, arid plains, dry savannas and open thorn bush from sea level to around 2000 m ASL (Fry et al. 2000). Their general behavior is not well documented but they are known to be solitary or to live in pairs and in flocks of up to 100 in the non-breeding season. They are usually fearless and aggressive. Their food consists of small ground-dwelling animals, carrion, some plants, bird eggs, ticks and lice (Fry et al. 2000). 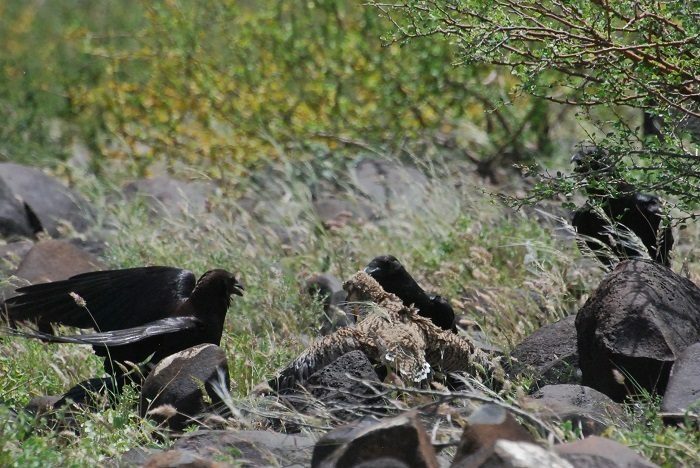 They are largely considered to be scavengers. 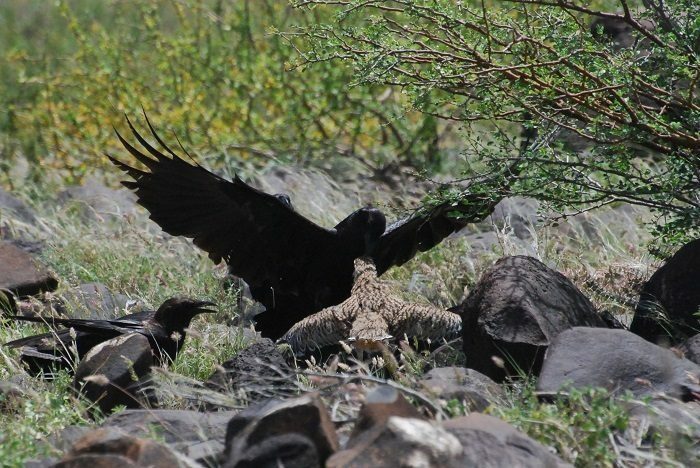 Thus, while at Turkana in May 2018 I was surprised to witness a small group of the species behave like raptors in pursuit of their prey. 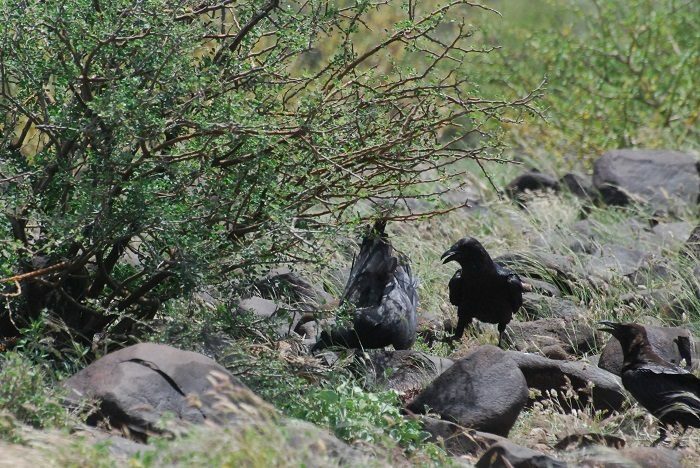 A group of three dwarf ravens landed about 50 m from where I was standing, and began rummaging through small dry bushes (Figures 1 and 2). Figure 2: The ravens entered the bush. (c) PS Wairasho. 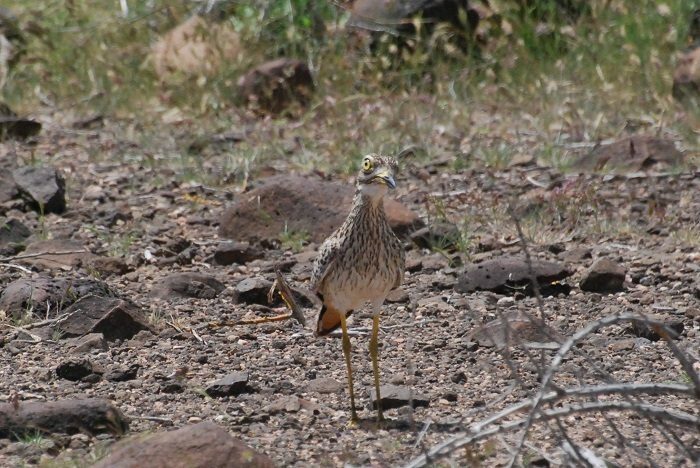 I had not even taken much notice of two fully-grown spotted thick-knees (Burhinus capensis) nearby (Figure 3), thanks to their cryptic plumage which blended well with the surroundings: sun-bleached volcanic rocks spewed all over this vast arid region interspersed by short dry grass and bushes. Before long, I noticed something emerge fast from the short bushes, apparently disturbed by the ravens. It was a young spotted thick-knee (Figure 4), not fully grown but just as tall as the parents, who were close by. 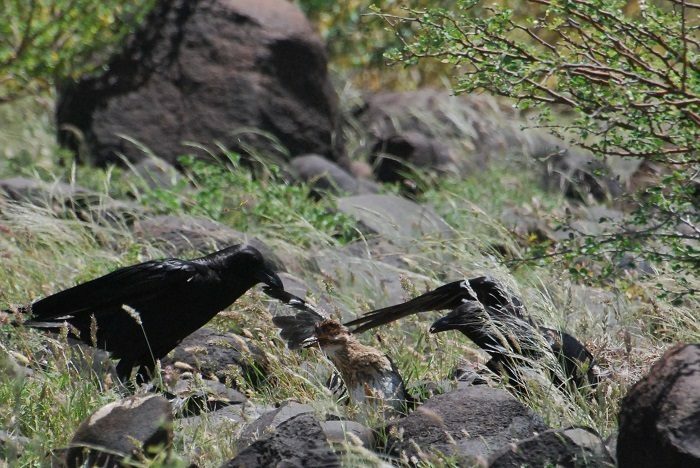 The ravens actively pursued the young thick-knee (Figure 5), caught it and relentlessly attacked it (Figures 6, 7, 8, 9). 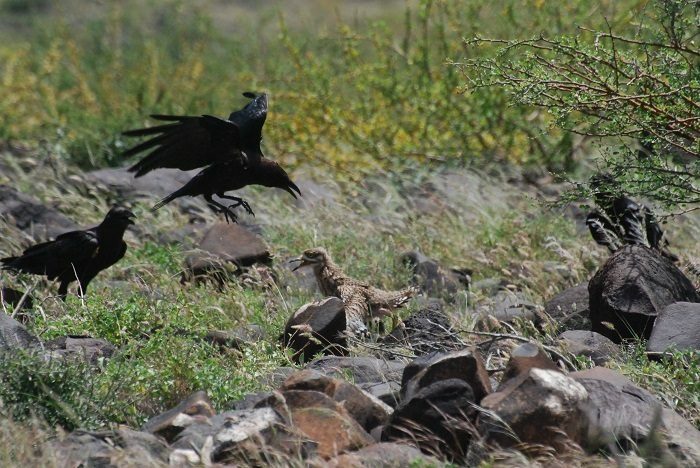 Figure 8: Dwarf ravens attacked the thick-knee. (c) PS Wairasho. 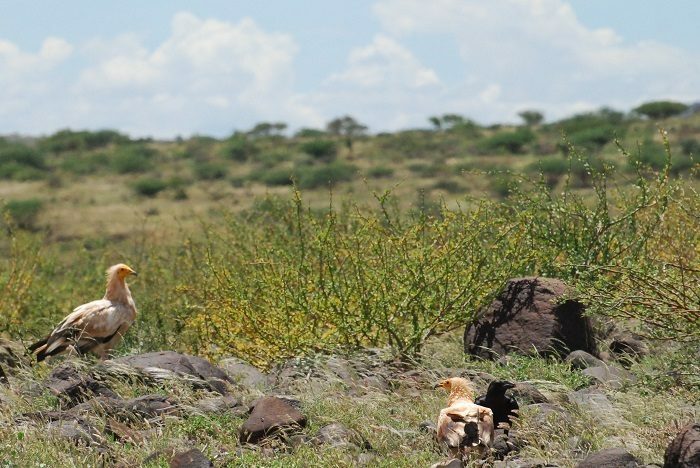 The attack was briefly interrupted when Egyptian vultures (Neophron percnopterus) landed nearby (Figure 10) and again when a white-headed vulture (Trigonoceps occipitalis) landed nearby (Figure 11). Figure 11: A white-headed vulture (Trigonoceps occipitalis) landed near the ravens. (c) PS Wairasho. The parents of the young thick-knee watched from a safe distance away and made no attempts to rescue the fledgling. 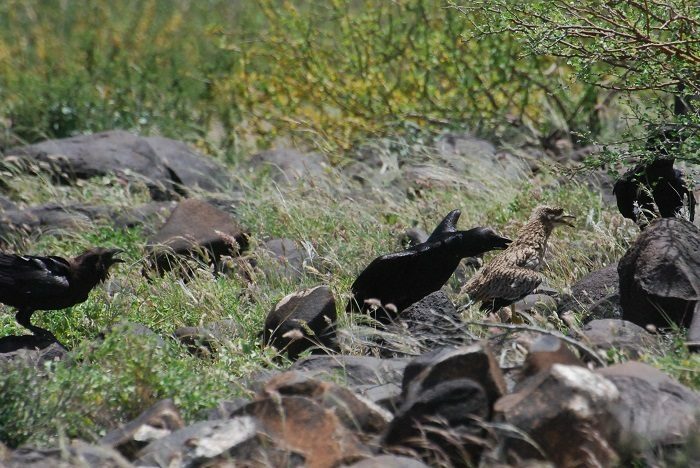 Eventually the ravens killed the thick-knee before proceeding to dismember it and devour it (Figure 12). 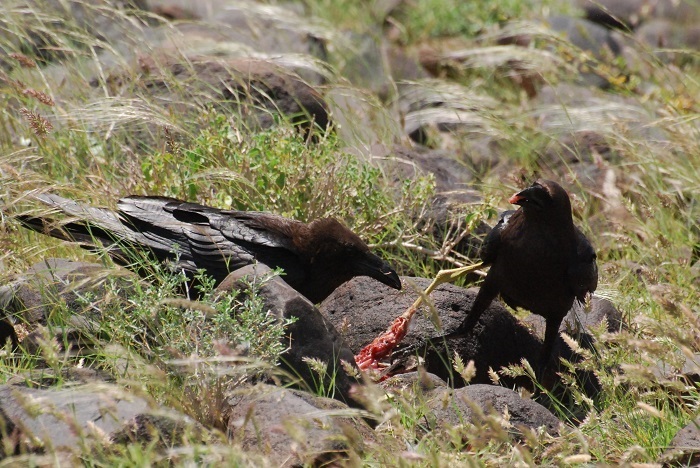 Figure 12: The ravens killed, dismembered, and ate the spotted thick-knee. (c) PS Wairasho. 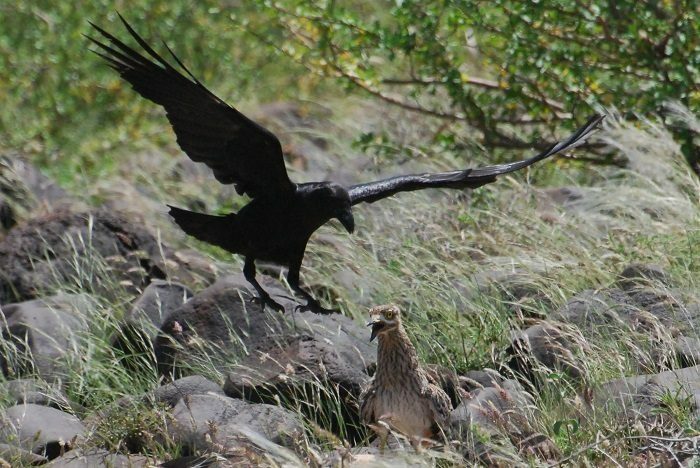 We could not find other records of Corvids actively hunting and killing live prey but it is likely desert dwelling corvids will often resort to catching live prey (of any taxa). Many thanks to Dr Peter Njoroge for his advice in the presentation of this record. Fry CH, Keith S, and Urban EK (Eds). 2000. The Birds of Africa Vol. VI Academic Press, London. Checklist of the Birds of Kenya, Fourth Edition, OS-c EANHS September 2009.